Adrift Again? How to Anchor the Japan-US Alliance from East-West Center on Vimeo. In the wake of the Great East Japan Earthquake in March 2011, the joint rescue mission of the US Forces Japan and the Japan Self Defense Force, “Operation Tomodachi," was extolled in both countries as a rock-solid proof of the strong ties of the Japan-US alliance. However, within a year “Japan handlers” again sounded the alarm in the so called “Armitage-Nye Report: The U.S.-Japan Alliance: Anchoring Stability in Asia.” The report warned that despite popularity boost from the disaster relief efforts, the long term strength of the alliance was at risk. The US wanted Japan to contribute more as a full-partner in at a time when Japan appeared to be at the crossroads either of fighting to maintain its status as a “tier-one nation” of global consequence, or quietly drifting into “tier-two status” under the weight of tremendous fiscal, political and regional challenges. In this way the Japan-US alliance is seen to be drifting again as in the 1990’s, possibly into wreck this time. 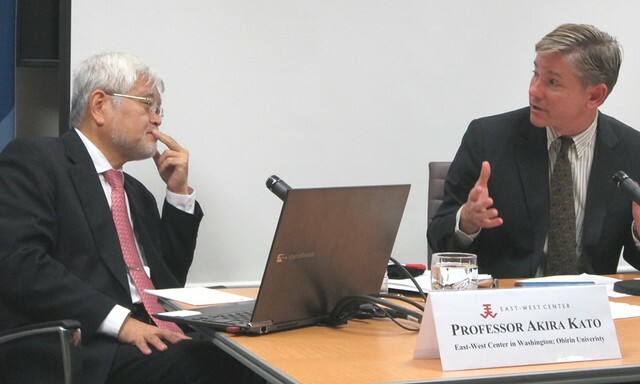 Professor Akira Kato analyzed the causes of this discord in the Japan-US alliance as stemming from of three clashes of perspectives between Japan and US: disagreements on values (hawkish liberalism vs. dovish pacifism), world view (whether or not we are moving toward a new US-China centric world order), and history (specifically the issue of comfort women). He concluded by offering his ideas on how both governments can anchor this drift by revisiting the original ideals of Japan-US Security Treaty. For Japan, he recommends that they remain pacifist, lest they give up their strongest asset-- their peace-centric soft power. He encourages the US to maintain its leadership in Asia, particularly its forward deployment of forces to discourage a regional arms race. "We have a common dream of freedom, which is anchoring stability in Asia," he explained. Discussant, Dr. Andrew Oros had four points to make in response to Kato's presentation. The first was that because the US and Japan share so many values across the board, we should not narrowly characterize our values in military terms. Second, he noted that for many years the US had to exert "gaiatsu," pressing Japan to take a larger role in global and security affairs. That it doesn't have to do so now is not, in his view, a sign of crisis in the relationship. He acknowledged that abandonment by the US in favor of China is indeed a concern in Japan, and therefore all the more reason for the US to redouble its commitment to Japan's security. Finally in the near future, he sees the Abe administration's plans and goals as closing tracking with American interests. Therefore he took a more sanguine view of the current state of the US-Japan alliance than Mr. Kato. Additional photos from this program can be found in the East-West Center's Flickr Gallery. Professor Akira Kato is a visiting scholar at the East-West Center in Washington and Professor of International Politics at Obirin University in Tokyo. Previously, he was a researcher at the National Institute for Defense Studies, the policy arm of Japan’s Ministry of Defense. He has written numerous articles and books on security issues and recently conducted field research on armed conflict areas in Syria, Libya, and Afghanistan. Dr. Andrew Oros is director of the International Studies department of Washington College. A specialist on the international and comparative politics of East Asia and the advanced industrial democracies, he is author of Normalizing Japan: Politics, Identity, and the Evolution of Security Practice (Stanford University Press, 2008), co-author of Global Security Watch: Japan (Praeger Press, 2010).